That is an unopened, albeit poorly wrapped, 1949 Tatoo gum tab alongside (it also came with a '48 tab) and I can report that, despite the wrapper in 1949 being a bit longer than the 1948 version, the tabs are the same size. The colors in 1949 seems a bit muted though. 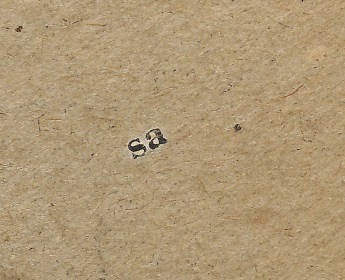 The canister is scarce with possibly only one other example known. Comics, Army and Sports are advertised subjects on this hemisphere while G-Men and Mystery appear around back. "Every Wrap - Another Tatoo" ballyhoo also appears twice along with the 1 cent price advisory. 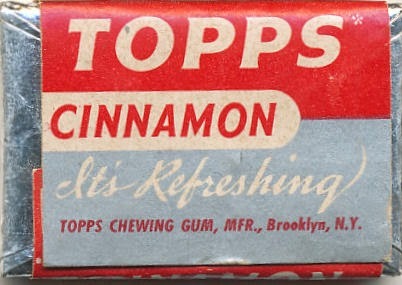 Strangely, neither Bubbles Inc. (1948) nor Topps (1949) manufacturing information appears anywhere on the tub, nor is there any other indicia. 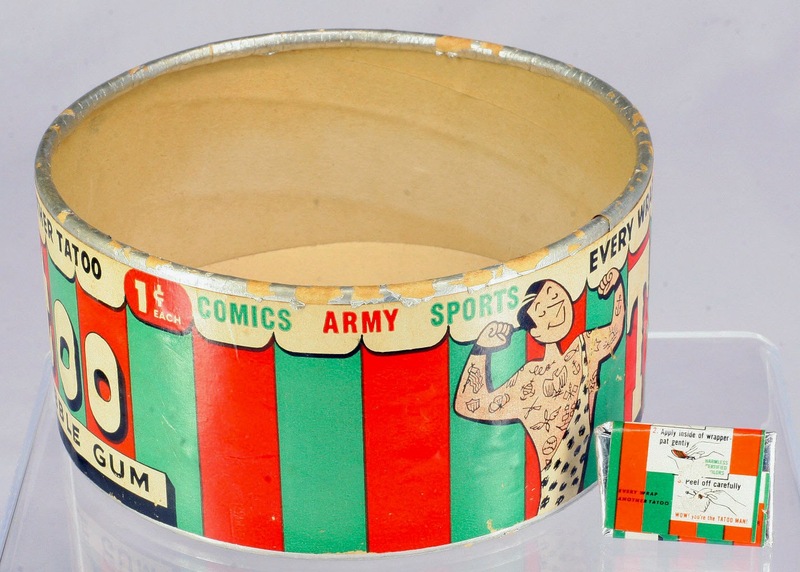 There was also a 1953 Tatoo issue but it was in a larger pack that I don't think retailed in these type canisters. 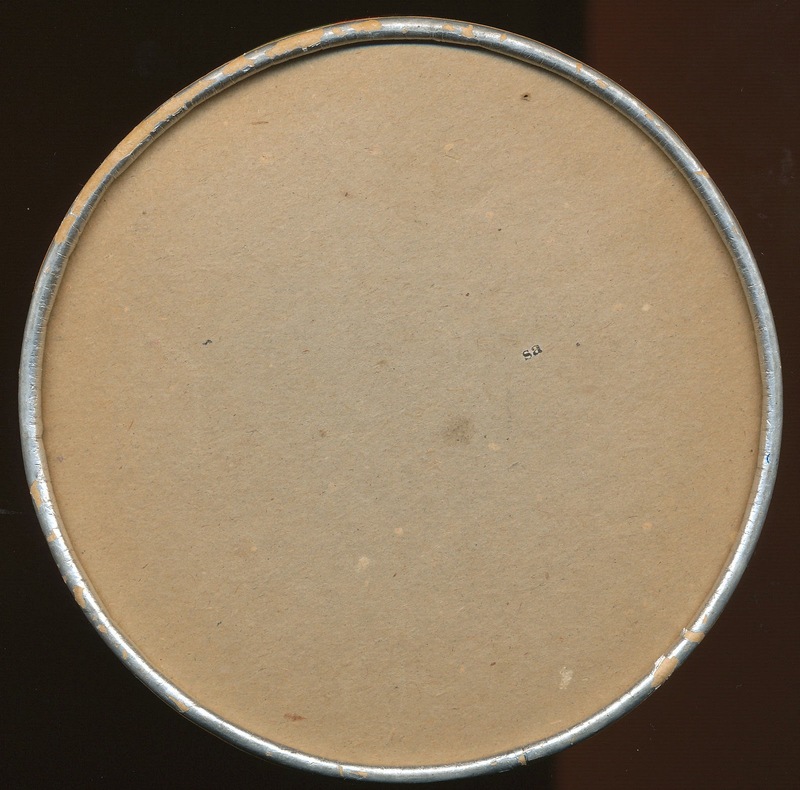 There are at least two earlier versions of this other canister by the way, one foil and one plain, and it would not surprise me if even more varieties are out there. 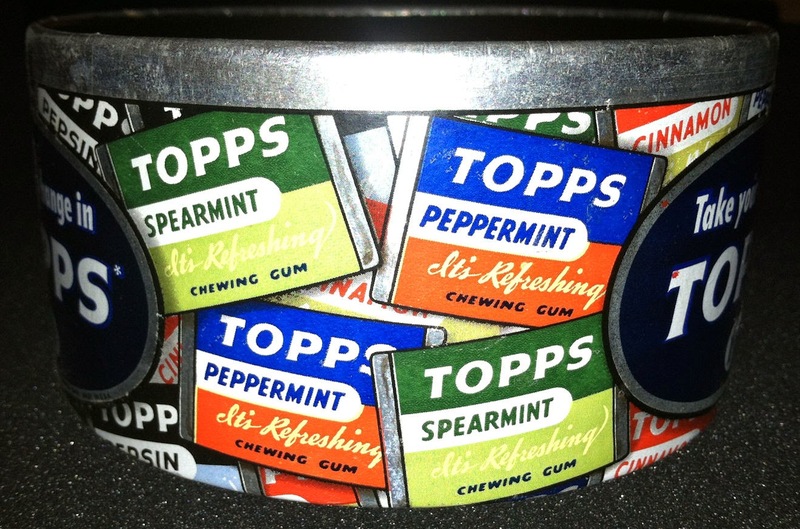 All of the Topps Gum canisters I have seen carry dated copyrights. When I started this blog almost six (!) years ago, I envisioned baseball-centric content primarily focusing on the 1960's and 70's test and limited issues and various pack inserts. The baseball theme has been largely abandoned in favor of an all encompassing millieu and the time frame has stretched back to the 19th century and occasionally forward to the 21st. Today's subject, 2014 Topps Archives Baseball, is easily the most modern set I have opined upon, mainly due to some good retro-design work by the current creative team at Topps. Don't get me wrong, I am not a huge fan of the modern retro sets' doodads and geegaws, even if the base sets are well done and appealing. The fake shortprints, chase cards and autograph inserts generally leave me cold. 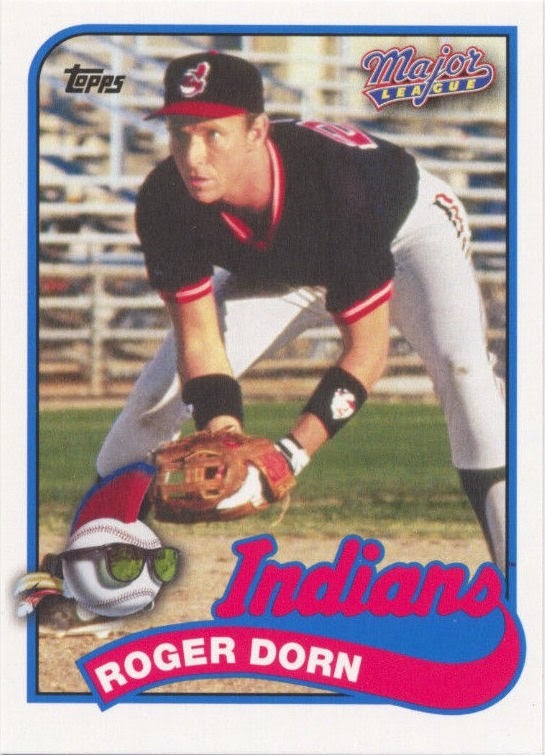 But it seems like once or twice a year now, Topps comes up with a nice subset that speaks to me. 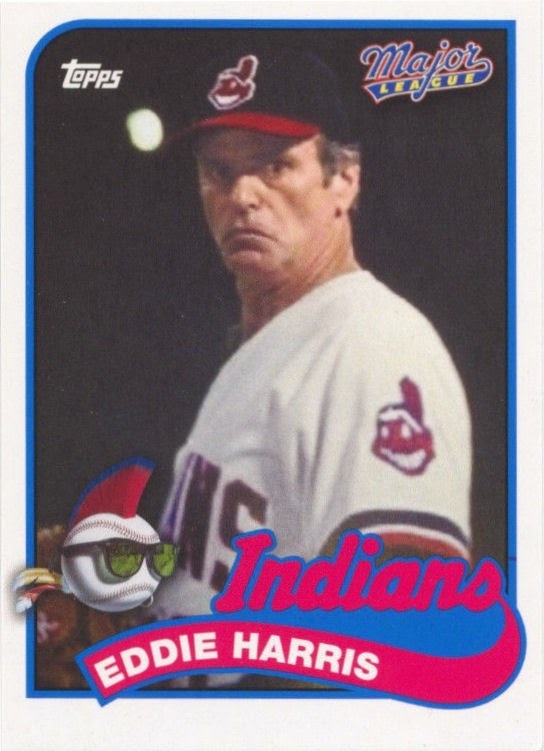 There are some other inserts in the series as well, including a 1969 Deckle-ish one but the Major League cards are the real stars. 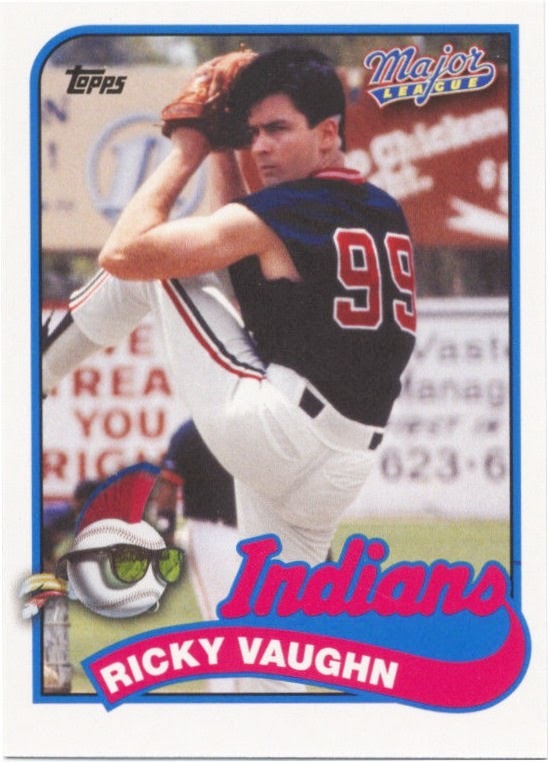 It's just too bad Topps could not manage to have cards of actual players who appeared in the movie such as Pete Vuckovich, Steve Yeager and especially Bob Uecker. Kid looks like he needs some steroids! 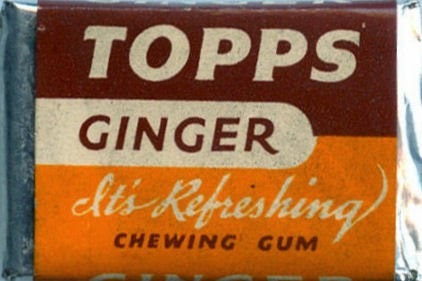 Bazooka was the main Topps bubble gum brand for decades but that didn't stop them from experimenting with some different confections from time to time while still selling oodles of Young America's Favorite. 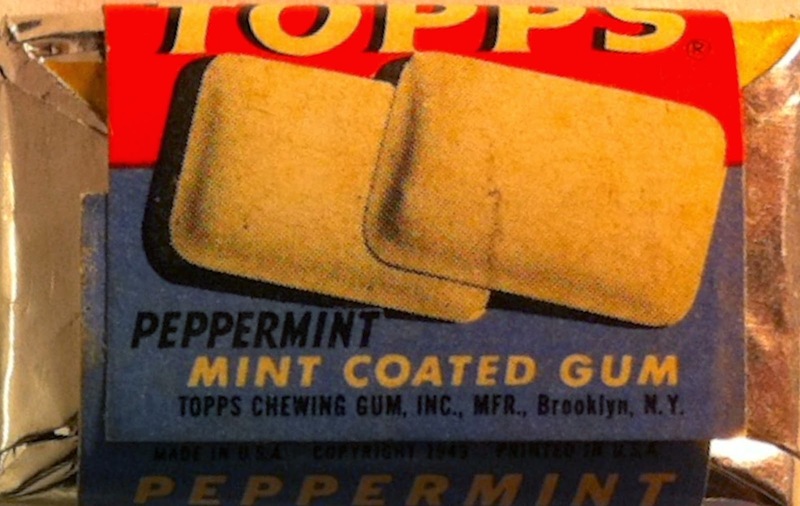 Blony (Bowman's bubble gum flagship at the time of absorption by Topps in 1956) was pretty much the stalwart #2 brand and Bozo gumballs seemingly went off to Canada after going gangbusters in the late 1940's. 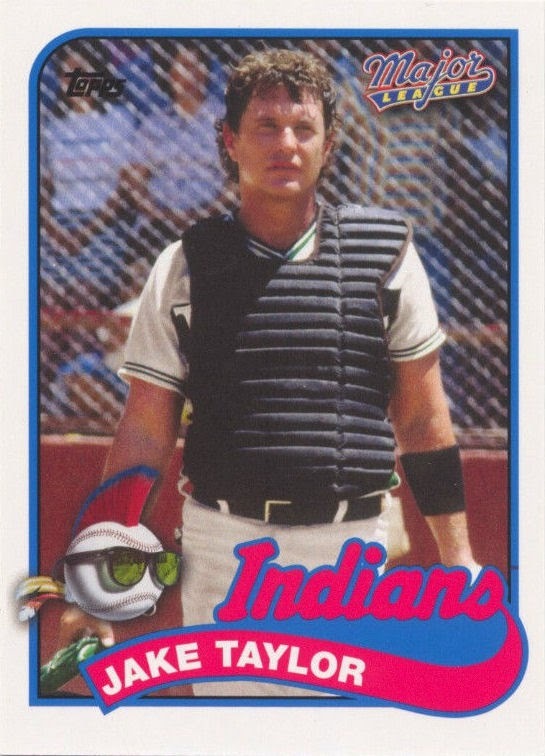 Topps most famously put baseball cards on the backs of Bazooka boxes for more than a decade but would muck around with other stuff as well, trying to move more and more of the pink stuff. I though we would take a hop, skip and a jump and look at some different things, bubble-gum-wise today. Said to measure 2 1/2" x 4 inches by a recent seller, there only a little more than a half ounce of gum inside but I'm not sure what the surprise was. I make the height to be about 3/4". 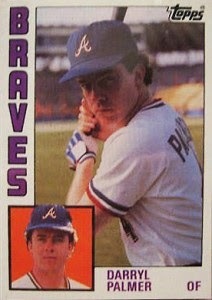 Here we go again pilgrims, with another tweak to the Topps timeline. 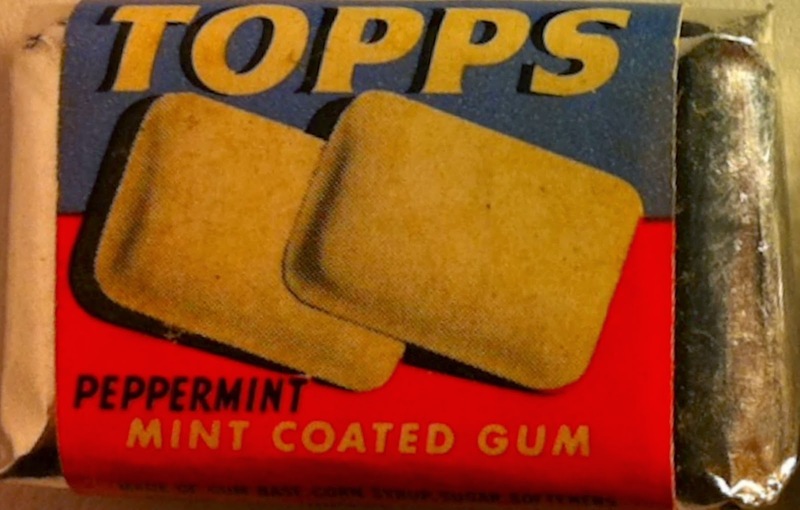 I thought I did a pretty good job with keeping errors to a minimum when I published the The Modern Hobby Guide To Topps Chewing Gum: 1938 to 1956 last year but knew some changes and updates would inevitably occur. I've already listed a few at the blog for the book and this will appear there as well. I can't say if these examples were produced at the same time but they look like a hybrid of the two previous types. Oh, and Shapiro Candy Manufacturing Company manufactured the one on the right. Shapiro, for those not in the know (and that is almost everybody on the planet given the minituae involved) was acquired by Topps sometime in 1944. 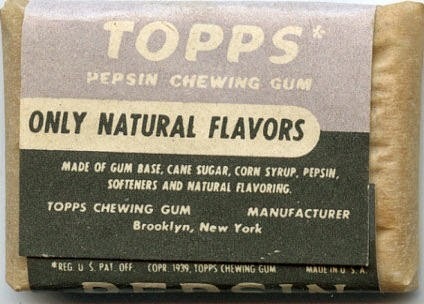 Shapiro's plant was also in Brooklyn and it was clearly a wartime play to stretch out their sugar quota but their new acquisition did also make candy products which Topps was already into at the time. Topps slowly absorbed Shapiro and it was fully digested by 1946. 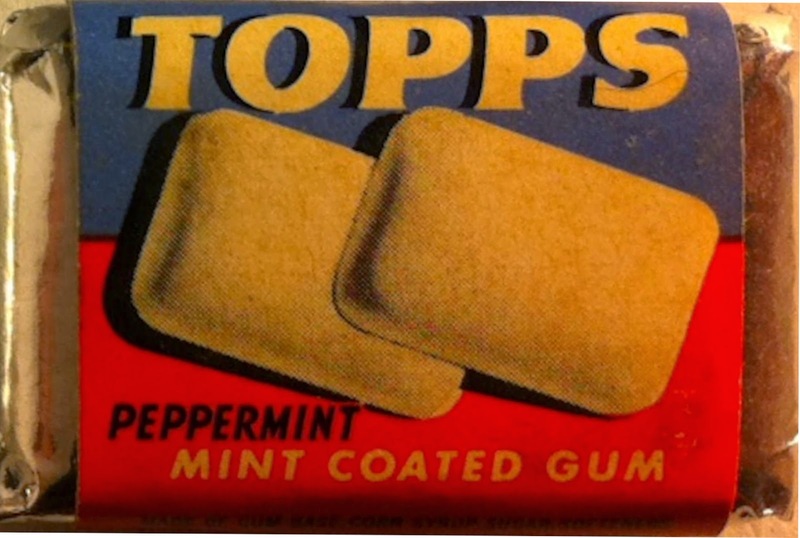 In addition a new copyright date for Topps Gum appeared on redesigned wrappers in 1946 so the Shapiro example above must date from 1944-45 or maybe just into 1946. 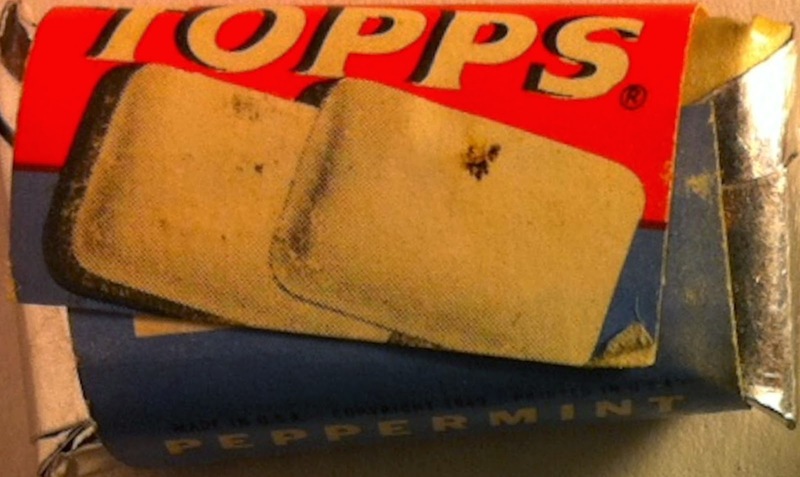 So the big question I have is: when did the 1939 Brooklyn wrappers come out? Also of note is the variant without the asterisk (indicating Registered with the U.S. Patent Office) if you look closely at the indicia. Shep has never seen one and the only place it has popped up so far as I know is in the Benjamin price guide but it looks like true 1946 wrapper. 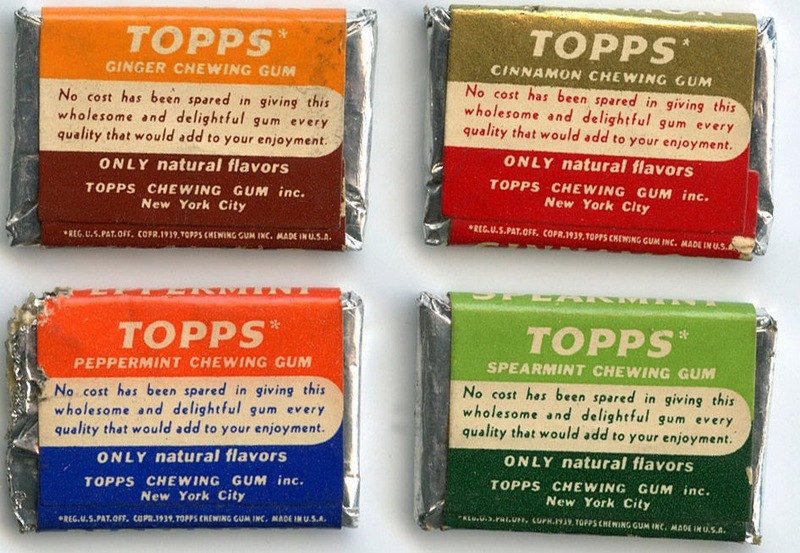 So we have seven potentially different Topps Gum tab wrappers, with up to six flavors potentially out there for all but the later, Chiclets-like products and it would not surprise me if more pop up.